Although there have been no work related deaths in the UK offshore industry for the last four years, health and safety professionals know that if disaster does strike it can have catastrophic human consequences. The Deepwater Horizon incident of 2010 saw 11 people killed, 16 injured and left devastating environmental consequences. It serves as a chilling reminder of what can happen in a weak safety culture if health and safety procedures are not well planned, well maintained and properly adhered to. Even more recently, 150 miles off the coast of Aberdeen, Total E&P UK’s Elgin wellhead platform experienced a major gas leak, which at the time of writing had not been isolated. Despite the causes not having been established, this naturally calls into question safety processes and risk management systems. Total evacuated 238 staff from the Elgin platform and the nearby Rowan Viking drilling rig due to the risks posed by the flammable and toxic hydrocarbon gas. For safety reasons, a two mile exclusion zone was placed around the two, while Shell also reduced staffing levels on its nearby Shearwater installation and drilling rig NobleHans Deul. Both incidents have startling similarities in that they both exhibit a loss of control. Both also involve a recovery that took and will take several weeks to manage, although it is not yet known how long the Elgin release will take to be brought under control. • Total workforce increased from 26,598 to 27,660 These figures suggest improvements to health and safety policies, but the nature of the industry is such that the record is fragile and prone to alter, because incidents, when they do happen, can be very serious. That said, statistics are not a good measure of the major accident hazard industry that the offshore oil and gas industry is. For this, an examination of the hydrocarbon leaks reported by operators within the UK Continental Shelf is needed. There are a number of occupational safety and health hazards that workers on offshore installations drilling for, or producing oil and gas, are exposed to. Types of work range from hotel and catering services, office work, power generation, maintenance, machinery handling, handling chemicals, cleaning, laboratory work, lifting operations, transferring supplies and dealing with waste and construction tasks including working at height. While many of these are par for the course, offshore locations may have to handle a host of other more unusual working conditions such as extreme weather, helicopter or boat transfers and limits to bed space. When an incident occurs, staff must react with the personnel and systems on the installation as they can’t simply call the ambulance or fire services and expect the incident to be managed by them. This means emergency response must be well thought out and well practised, with rigorous planning applied to major shutdowns and modifications, as well as shift work being carefully mapped out. 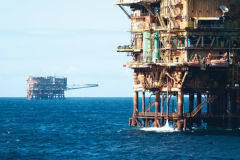 The most significant risks to offshore staff arise from major hazards. These can result in large scale fatalities and major damage: the worst cases even lead to loss of the whole installations, as with Piper Alpha and Deepwater Horizon. These major hazards can be broadly grouped under fire and explosion, or structural collapse and loss of stability. Subsurface oil and gas reservoirs are typically over pressured and rise to the surface when being drilled into. Reservoir pressure abates as oil and/or gas are produced, and down hole pumps may be used towards the end of field life. Yet even in these cases, high pressures are needed on the installation to process the reservoir fluids and transfer the highly flammable products to shore via pipeline or to a tanker. All drilling and production equipment must be designed, operated and maintained to ensure its pressure integrity. Unfortunately, risk of a leak is ever present due to equipment or human failure. If a leak ignites immediately there will usually be an intense fire; if ignition is delayed, however, and vapour accumulates in a confined or congested area, there will be an explosion. Offshore installations typically have many sensors to detect gas or flames. These initiate automatic shutdown, starting inventory isolation and depressurisation via a flare, and alert personnel on board to the emergency. The on board inventories are such that, even when these systems work well, a major event can result. If the leaking inventory is the reservoir itself, such as Deepwater Horizon where a blowout occurred, or a major export pipeline like Piper Alpha, loss of the whole installation is probable. To maximise personnel survival in such escalating incidents, installations typically have extensive escape routes to a protected temporary refuge. They also offer several options for escape and evacuation to sea should the incident continue to escalate. If the leak does not ignite and is from a large inventory such as a reservoir or pipeline, this can cause significant pollution to the marine environment, with the hydrocarbons capable of drifting large distances and possibly coming ashore. Although there will be no human injuries or major equipment damage, for the operator and the industry in general the economic and political consequences of a major pollution event can be at least as severe as from an ignited leak. There are two types of offshore installation: fixed structures, which are secured to the seabed, and floating production installations, which are designed to be relocated or used in deep waters where a fixed installation can’t be used. Every installation is designed to withstand defined wind and sea states, specific deck loads, and certain degrees of fire and explosion, but parts of the structure can deteriorate or become damaged during an installation’s operating life. For floating installations stability is a key design parameter. To lose stability would mean causing significant damage to the subsea pipelines and manifolds used to import and export the oil and gas. This could result in a structural failure, giving rise to a fire or explosion, or even cause it to sink. The consequences of structural or stability failures mean that a great deal of effort is put into the design of offshore installations, and into the monitoring and control needed to ensure safe operations. Such matters are scrutinised by both verification bodies, under class and verification schemes, and the HSE within each installation’s Safety Case. The Safety Case Regime was introduced on the recommendation of Lord Cullen, following his landmark inquiry after the Piper Alpha disaster on July 6, 1988. As noted above, each offshore installation’s design has to be appropriate for the specific environment it will need to operate in. The characteristics of the oil or gas reservoir will be a major factor in terms of its pressure, temperature, ratio of oil or gas and flow rates. Other factors include the water depth, export arrangements, local weather and manning levels required on board. The Safety Case for an installation is a summary of these variables, with a description of the specific design, emphasising how it has been built to ensure that risks to all personnel are acceptably low. Major hazards, which could result in multiple deaths, are the biggest emphasis of a Safety Case. As well as the initial design, the Safety Case addresses the installation’s operating arrangements, ergonomics, human factors and the means by which the design integrity will be maintained and assured during its full operational life. In short, it addresses the whole life cycle of an installation. It is a live document requiring thorough review, which is submitted at least every five years to the HSE for its acceptance. Material changes to the operation, installation or management are similarly required to be submitted to the HSE. Safety representatives are also involved in the preparation and revision of a Safety Case. One of the key aspects within a Safety Case is the identification of Safety Critical Elements (SCEs). These are components that are critical to the overall safety performance of an installation and are designed to prevent a major accident. The required performance of each SCE is recorded and checked to ensure it is performing, or will perform as designed or required. Because no system can be 100 percent reliable, however, operational arrangements must also be established to manage the situation, should a SCE become partly or wholly impaired. The HSE is seeking to improve the long term integrity and residual safety of offshore installations across the whole of the UK continental shelf through KP4 (Key Programme 4): an ageing and life extension inspection programme running from 2010 to 2013. It takes a long term view of health and safety to provide the best understanding of the effects of ageing and use of facilities. Approximately 40 percent of the installations on the UK Continental Shelf are 25 years or older, and many of these have now exceeded their design life. The reason for this is invariably positive, in that the production technologies now available to the industry have enabled a significantly more efficient recovery from the subsea oil and gas reservoirs. KP4 is about the HSE working with industry to review the way mature assets are managed and to ensure that ageing processes are understood. This enables operators to manage the risks and ensure long term safe production. While a new field can produce dry oil and gas, at some point water will often migrate through the reservoir rock formation, mingling with oil or gas being produced. The breakthrough of seawater into the system is very likely to cause corrosion within the production system. If these systems aren’t designed to resist corrosion or if they have exceeded the amount of corrosion the original design allowed for, the production system integrity needs to be assessed against what will happen in the future. KP4 promotes the principle that prevention is better than cure, with proactive understanding and management of problems such as these. The HSE alongside Oil & Gas UK are working with the offshore industry to look more at long term integrity management, and a work group has been established to raise the awareness of and share the best practises available. Areas covered include control and instrumentation, fire and explosion, human and organisational factors, maintenance engineering, materials and corrosion, mechanical engineering, offshore pipelines, process safety, structural integrity and wells’ integrity. Over three years the HSE is inspecting a sample across the whole of the UK Continental Shelf to examine the more at risk installations and further support cross industry learning and sharing. An interim report is due later in 2012 to mark the halfway stage of KP4. EU law On October 27, 2011, the European Commission (EC) proposed new legislation, in the form of a regulation to address its concerns over the standards of offshore health, safety and environmental management within the EU. The source of European concern was the major Deepwater Horizon incident, and the regulation was proposed in order to establish what the EC has called “A stringent safety regime... to bring the risk of such an incident down to a minimum.” It believes the possibility of a large scale accident occurring remains unacceptably high, and sees the need for a harmonised emergency response plan to mitigate the environmental consequences from a major oil spill. Although this desire for safety is right and proper there are some strong concerns from most, if not all corners, of the existing offshore industry within the EU and Norway. In its response to the proposed regulations, Oil & Gas UK has expressed concern about EU regulations over offshore safety on the grounds that it dismantles the UK’s world class safety regime by putting in place a centralised set of rules. The UK government has also signalled its intention to oppose the regulation in the interests of safety. In the proposed regulation, the EC has stated that countries in the North Sea make up a region where offshore drilling and exploration safety is considered among the very best in the world. The EC says it wants the rest of Europe to meet those standards. It’s on these grounds that Oil & Gas UK has opposed the central application of the rules, but it does support the EC’s goal to bring all member states’ offshore safety regimes up to the standards of those bordering the North Sea. Oil & Gas UK would prefer to see a directive that can enable the best existing practises to be maintained, without disruption to the well established regime already in place. To dismantle good practise is very likely to have a negative effect upon offshore safety in the short to medium term, while in addition, the long term case has still not been made. This EC draft legislation will now pass through the EU legislative process for voting on by the European Council and the European Parliament. Following the Elgin gas leak, indications from the EC suggest that more controls in the form of the proposed regulation are very much required. Offshore exploration and production is a complex, high hazard activity. It requires a great deal of control through installation and well management, from operators and during collaboration with contractors to manage health and safety risks. North Sea exploration and production operations have an enviable health and safety record and are widely acknowledged to operate with some of the globe’s best practises, but there is always opportunity for improvement. The HSE’s KP4 project forms part of that potential, especially with an installation stock whose lifecycle is often required to last beyond its original design life. Any EU legislation will only be justifiable if it demonstrates improvement to all EU offshore safety regimes, without reducing standards in those areas where there is existing good practise. The time and cost of imposed change could deter further investment in the industry and may well be detrimental to the industry’s safety performance, meaning the case for change is still to be made. One thing is for sure: the offshore industry needs to continue to be proactive about its health and safety in order to drive its standards and prepare for its future. A strong culture and appropriate health and safety processes are essential and these must be rigorous so as to account for the complexity and variety within the industry.